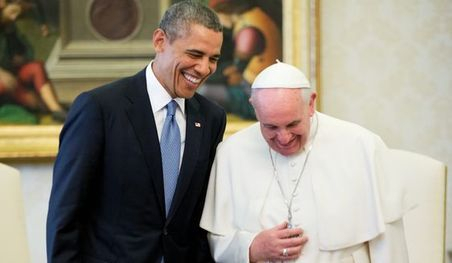 President Obama's New Political Ally.....the Pope! To soothe American Catholics, who may have grown suspicious of the church’s partnership with a liberal White House, the pope in the coming months and years is likely to zero in on fundamental disagreements with the Democratic Party on issues such as abortion and religious liberty, said Joseph Prud'homme, a political science professor and the director of the Institute for the Study of Religion, Politics, and Culture at Washington College. “I believe Francis will remind the faithful in his position as supreme pastor about what he has consistently said about life and religious liberty. I hope, and I expect, that he will, after these initiatives [on Cuba and climate change], remind the faithful of the unending position of the church with respect to the sanctity of human life, the importance of religious liberty,” Mr. Prud'homme said. The White House praised the pope this month for playing a critical role in a landmark deal with Cuba, one in which the U.S. will re-establish formal diplomatic ties and open an embassy in Havana for the first time in more than five decades. Mr. Obama already has struck a historic climate accord with China, begun to impose harsher carbon emissions restrictions on U.S. power plants and taken other steps to curb climate change. He is expected to call for even greater action during a U.N. climate summit in September, and Francis looks ready to do the same. The Guardian newspaper reported this week that the pope plans to address the gathering and aims to be one of the most prominent voices in attendance. Early next year, Francis also will publish a letter to the world’s bishops urging greater action on climate change, the newspaper reported. While the pope’s activism on the issue isn’t entirely new — the Catholic Church’s tradition has affirmed for centuries that environmental stewardship of the Creation is a moral duty to the Creator — his appearance at the U.N. conference will again place him alongside Mr. Obama on a controversial issue. Still, analysts say, it’s unlikely Francis will embrace any of the president’s programs by name and instead will speak in broad terms about the need to care for the environment. “I don’t anticipate the pope making very specific endorsements,” Mr. Prud'homme said.